Photo by Sonya Allin from "Bike Bus or Bust." Electric assist bikes, or pedelecs, are becoming more and more popular. Electric assist can be particularly helpful on a family bike, where you are typically transporting children, groceries, and sports equipment. Electric assist can help with hills, distance, and acceleration. With electric assist on your family bike, you will not be going faster than regular cyclists: the motor just helps you compensate for the extra weight of your family and their stuff. Pedelecs make a wider variety of trips feasible by bike for a greater number of people, including young families and seniors. The prices for this technology have been steadily decreasing, and this trend will continue. The most expensive component is the battery, and batteries are seeing tremendous and continued innovation. My family recently added an electric assist to our family tandem. 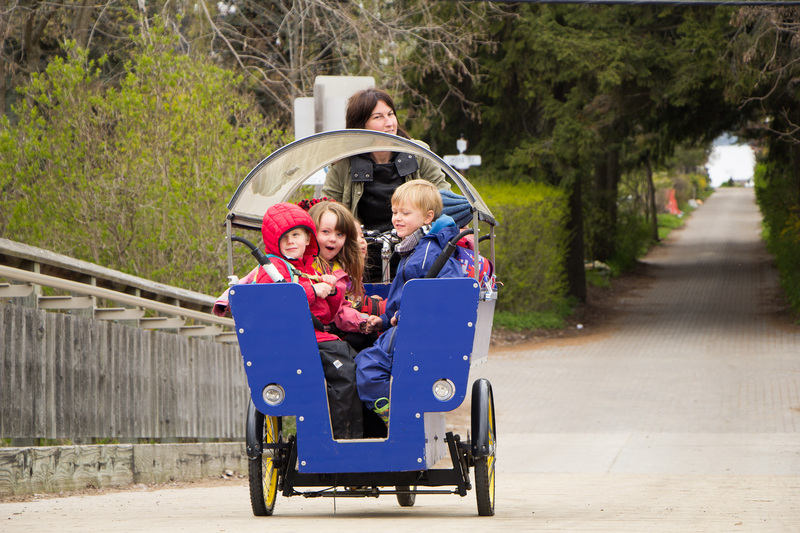 Our family tandem has three pedalling positions, plus space for two more children who are not pedalling. Additionally, I help maintain the “bike bus” owned by my daughter’s daycare, which is a tricycle that can seat 6-8 toddlers (plus the adult rider.) These are both Dutch bikes, which means that they are designed for relatively flat terrain and had internal gears. 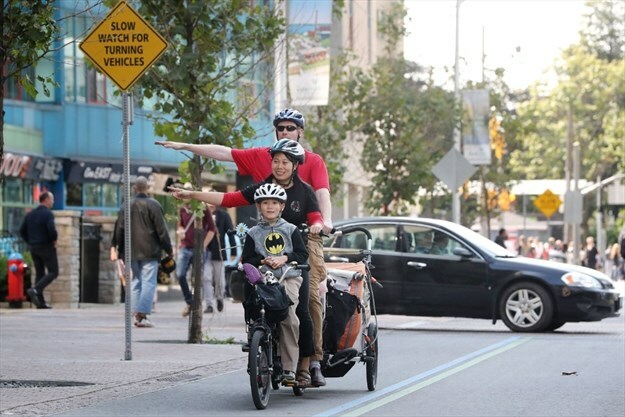 Derek Rayside, Stephanie Xie, and their children on their family tandem before electrification. Photo by Alexa Rayside, February 15, 2016. 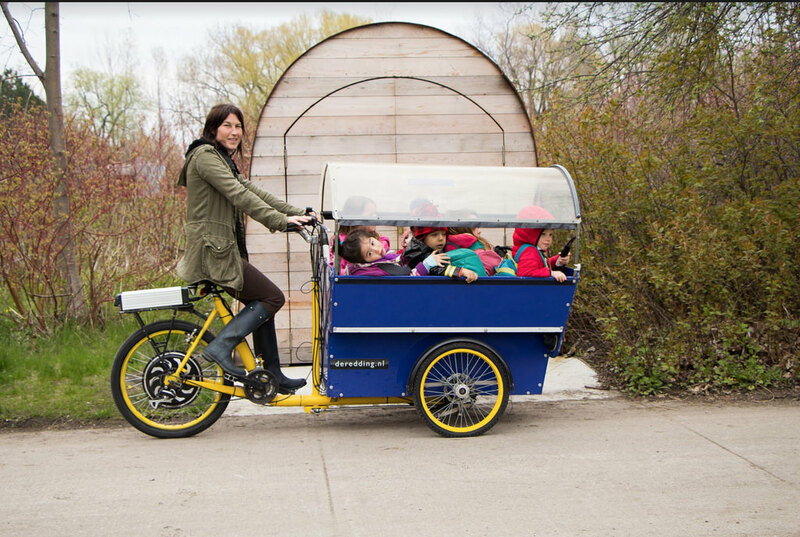 The bike bus, owned and operated by Waterfront Montessori Children’s Centre on the Toronto Islands. Photo by Sonya Allin, dandyhorse, June 6, 2017. The first question to ask yourself is whether you really need to electrify. If you do, then this article reviews the simplest options first, and afterwards describes the more complex solutions we used on the family tandem and the bike bus. Electrification can affect the bike’s gears and brakes, so I recommend a holistic approach to selecting the right technology for your situation. 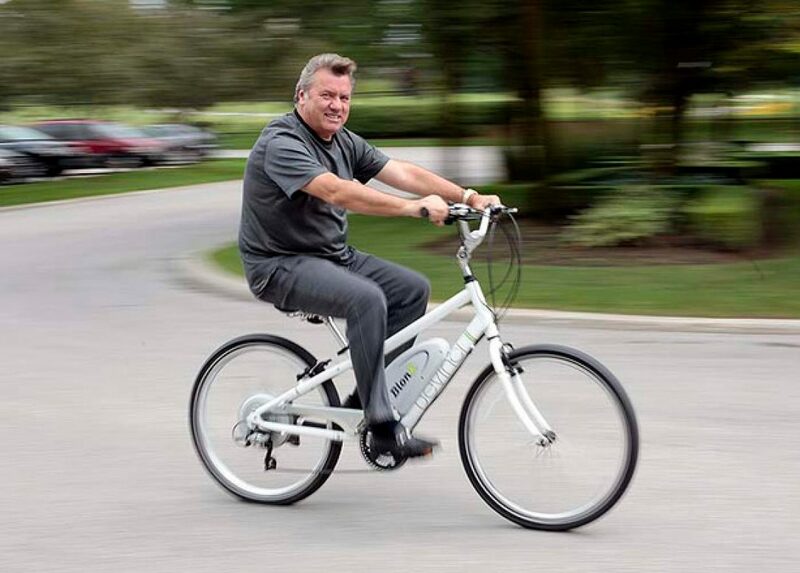 This article recommends products from BionX and Grin Technologies (ebikes.ca). The BionX kits are amongst the easiest to install and are widely recommended by other reviewers, although I do not have personal experience with them. If those kits do not meet your needs, then I recommend products from Grin Technologies in Vancouver, which is what I used on our family tandem. They design the computers and controllers, and many accessories such as battery mounts, auxiliary input switches, torque arms, etc. They import motors from Asia, as well as brakes and torque sensors from Europe. Many other websites re-sell Grin-designed computers and controllers with different motors and batteries. The way I think of it, BionX is like the Apple of e-bike kits: nice integrated products that work really well for most people most of the time. By contrast, Grin Technologies is like GNU/Linux: modular components that can be configured for the most challenging situations, but requiring a bit more technical expertise to install. 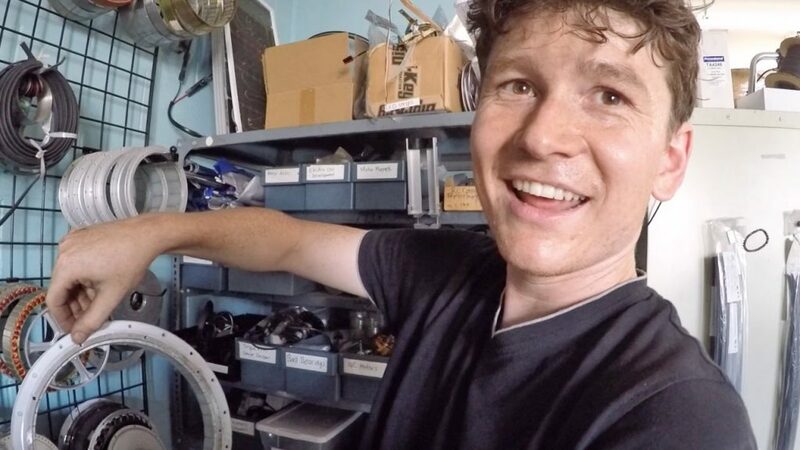 Justin Lemire-Elmore founded Grin Technologies (ebikes.ca) when he was an electrical engineering student at the University of British Columbia back in 2005. ElectricBikeReview.com made an excellent video interview with him in 2015. Your local bike shop might sell and support different e-bike conversion products. If so, then those are well worth considering. A local shop that knows you, your bike, and the products they sell, is always a good option. Thank you to readers who wrote in asking for answers to these questions. For those in America, Europe, and other parts abroad, any prices here are in Canadian dollars in the Toronto market, which might differ from your local market. Do you need to electrify? Do you need electric assist on your family bike? Millions of people around the world ride family bikes without electric assist. In my observation, it depends on three factors: distance, weight, and hills. We rode our family tandem without electric assist for two years. Most of our trips are about 3km, on mostly flat roads. In that kind of distance and terrain, the weight doesn’t really matter: you can probably move 100% of your body weight in payload. For longer distances --- still on flat ground --- we found that we could go 5km about once per month, and 10km once or twice per year. Now with our electric assist, we can go to further locations and surmount larger inclines. For example, our trip to Costco is just under 15km, and involves a bridge over the Gardiner Expressway. Getting over that bridge with groceries requires all of us pedalling hard plus the motor at full throttle. Our gross vehicle weight up this bridge is over 600 lbs. Derek Rayside, Stephanie Xie, and their children ride their family tandem, with electric assist, home carrying groceries from Costco. Photo by Steve Russell, Toronto Star, September 29, 2017. Before the electric assist our average speed was about 14 km/hr, and now we can average around 20 km/hr. For our everyday 3km trips this doesn’t really make a difference in time, but for trips over 10km it can matter. My daughter’s daycare chose to electrify the bike bus because they need to go over a steep bridge, and the combined weight of the bike and the children is approaching 200% of the weight of the rider --- roughly 400 lbs gross vehicle weight. The bike bus ascends the bridge from Algonquin Island. Photo by Sonya Allin, June 6, 2017. Map out the routes you usually travel for family activity: How long are they? What’s the elevation like? Take a few test rides with your regular bike. Bring along a child in a trailer or on a rear child seat if you have one. Getting a physical feel for the terrain will help you determine if you will benefit from electric assist. If you know you want electric assist, and are buying a new bike, then get one that comes with electric assist built in. Do not try to save money by doing the conversion yourself. You won’t actually save money that way, and doing the conversion is a project. I like these kinds of projects, but they still take time. If you are in a situation of doing a conversion, then first look at kits like BionX. Those are really nice kits that are highly recommended by many reviewers: simple to install, high quality, and pleasant to ride. Manfried Gringl started BionX in 2008, after over forty years at car parts manufacturer Magna International. BionX is head-quartered in Aurora, Ontario, with an R&D facility in Sherbrooke, Quebec. Photo by Pawel Dwulit, Toronto Star, July 24, 2009. But those simple kits might not work for your Dutch family bike. Why? Gears. BionX are rear-wheel kits that replace your entire rear wheel. The Dutch like internal gear hubs, so if you swap out your rear wheel then you lose your existing gears and must find a way to replace them. All of these after-market conversion kits are intended to be DIY. My experience and observation is that you might want to have a good relationship with your mechanic(s) when converting a family bike --- especially a Dutch family bike. Once you get into matters like changing the gearing, brakes, fork, etc, you are moving beyond what would be involved in converting a regular bike. I have been fortunate to have the services of a variety of excellent mechanics in the Toronto area. 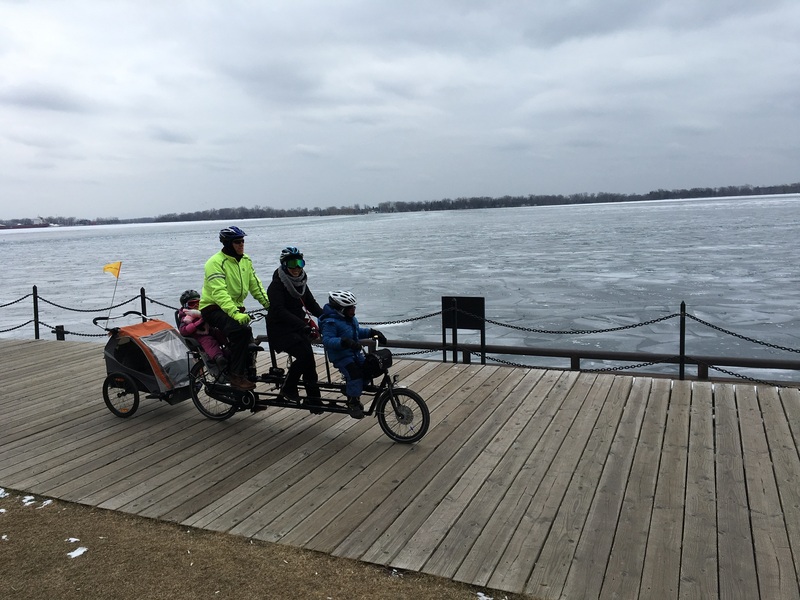 The heavy lifting on the family tandem conversion was done by Dan Burkhart of the Waterfront Wheelshop in Oakville (facilitated by Stuart Kinnear in Toronto). The electrical work on the bike bus was done by Amego at Richmond and Portland. Malcolm Munro at Biseagal on Carlaw has done all of the major mechanical work on the bike bus, and quite a lot on the family tandem as well. MEC on King St, Dream Cyclery on Queens Quay, and Ya Bikes! on Queen East, have all gotten us back on the road after minor mishaps. 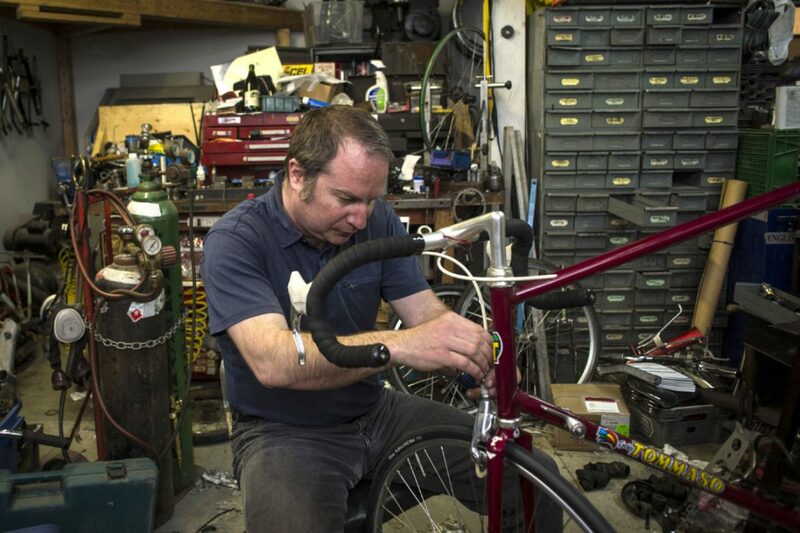 Mechanic Malcolm Munro at his shop, Biseagal, from a profile in The Toronto Star. Photo by Eduardo Lima, Metro News, August 31, 2017. When designing your conversion project, assess the work that needs to be done and who might have the skills and tools to do it (possibly yourself). Most of these bikes are put together using systems of not-exactly-standard parts, and when you replace one part, you’ll often find that it has an effect on the rest of the system. So be thorough in your planning, and make no assumptions about compatibility. You might need to work with different mechanics for different aspects of the project. Not every North American mechanic wants the challenge of working on a Dutch family bike, and not every good bike mechanic wants to get involved with electric conversion kits. Finally, my observation is that market pressures force good mechanics to charge no more than average mechanics (and sometimes even charge less). The downside of that for you is that good mechanics will have more work than they can do, so getting their time can be challenging. What To Do About Gears? Front wheel motor. This is what we did on our family tandem. Add external gears. This is what we did with the bike bus. Mid-drive motor. A good option if it fits. Rear wheel motor with integrated internal gear hub. A unique product worth considering. A front wheel motor is the simplest and easiest approach. On a two-wheel bike, a front motor leaves your existing rear wheel and gearing system in tact. There are some rumours that a front wheel motor installation is not as good as a rear wheel motor installation because front motors might be less powerful, or there might not be enough weight on the front wheel and it might slip. Many motors have both rear and front wheel variants with the same power. Because family bikes typically put much more weight on the front wheel than single-person bikes, the front wheel losing traction is usually not a concern (certainly not on our family tandem). We installed a front wheel motor on our family tandem and it works well. I think that for a tandem a front wheel motor has two additional advantages: it reduces the force going through the drive chains, and it provides redundant mobility in case one of the drive chains breaks. The bike bus, being a tadpole tricycle (two wheels up front), required a rear wheel motor. If I were doing the bike bus electrification from scratch, I would probably choose the TDCM+IGH rear wheel motor with integrated Sturmey Archer internal gear hub (243% range). As it was, a previous volunteer parent had already installed a rear wheel motor kit and left the bike bus as single-speed. To protect the investment in the existing electrification kit, we added the external derailleur. That required some welding, which is beyond what most bike mechanics will do, and was not cheap: it ended up costing about $700 for parts and labour. A mid-drive motor is one that attaches to your frame, usually near your pedals, instead of in the wheels. Many of the electric-assist family bikes on the market now come with mid-drive motors from either Bosch or Shimano built-in. These are great products, but usually need to be designed into the frame, and so are not suitable for after-market installations. There are two mid-drive conversion kits that I am aware of that are suited to after-market installations: Bafang and Stoke Monkey. Both are good products that are well reviewed elsewhere. The Stoke Monkey was originally designed for the Yuba Mundo longtail bike, but could fit on other bikes. The Bafang might fit on your Dutch family bike: Urkai in Burlington installs these on Bakfiets family bikes. Your family bike should have a direct-drive motor paired with a controller capable of regenerative braking. The important reason is not how much power you will regenerate from braking: that really doesn’t matter. The important reason is stopping power. Once you have electric assist, you will be able to go up hills. Now you will need to get down them. The stopping power of our family tandem motor is better than even our Magura HS-33 hydraulic brakes (these are popular on Dutch family bikes with electric assist). Your regenerative braking might be so powerful, as it is on our family tandem, that it requires a second torque arm. 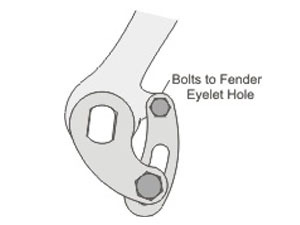 A torque arm is a little piece of metal that helps distribute the force of the motor on the bike frame. Without a torque arm, the motor might rip itself out of the frame. Most regular bikes require just one torque arm, to stabilize the motor when the bike is going forward. Fully loaded family bikes tend to be much heavier than regular bikes, so you will probably want a second torque arm to stabilize the motor while braking. Having regenerative braking capability will also help prevent your mechanical brakes from overheating on descents. With regenerative braking, the energy goes into driving the chemical reaction inside the battery, rather than just producing waste heat. If your mechanical brakes overheat, it might compromise their performance and your family’s safety. Regenerative braking will also reduce the wear on your brake pads, which means you will replace them less frequently. Until recently, using your regenerative braking required replacing your brake levers. For regenerative braking to work, the brake levers need to tell the motor controller when you are trying to brake. This past year, Grin and their collaborator Tim O’Brien developed the Tripwire product that attaches on to your existing brake levers. We have these on our family tandem and I recommend them. Our family tandem originally had a Shimano IM-81 roller brake in the front wheel hub. That had to come out with the installation of the front wheel motor. Since the front fork was designed for a roller brake integrated into the front hub, it did not have braze-ons (mounts) for either disc brakes nor V-brakes. We ordered a replacement fork from our bike maker Onderwater (via Urkai in Burlington) with braze-ons for V-brakes. It appears that many of the Dutch family bike companies are using the Magura HS33 hydraulic rim brake up front, so we went with that. How Hard Are You Pedalling? A torque sensor measures how hard you are pedalling, and then applies the electric assist proportionally. This gives the best riding experience. A cadence sensor detects if your pedals are spinning, and then applies the motor at a predetermined power level. There is a common misconception that cadence sensors detect how fast you are pedalling: most of them do not do this; they just detect whether you are pedalling or not. A manual throttle control lets you use your hands to activate the motor. It is good to have a throttle control in urban environments where there is a lot of starting and stopping. European regulations limit throttles to speeds of under 6km/h, so the throttle can be used to get the bike started, but you must pedal for the bike to really go. Nice kits like BionX will have an integrated torque sensor. If you are assembling your own kit from components, I recommend including a torque sensor for the best ride quality. Usually these install in the bottom bracket, and require drilling a hole through the bottom bracket for the wires. The cadence sensors are typically easier to install and do not require drilling, and are significantly less expensive. When coupled with a throttle, a cadence sensor still gives a good ride quality. If your kit uses the Cycle Analyst computer from Grin Technologies, then I also recommend getting one of their auxiliary input switches. These allow you to control the amount of electric assist while you are riding, without having to fiddle around with the computer. You will want one of these if you ride a family bike in an urban environment. For example, if I see a red light in the distance, I use the auxiliary input to turn off the electric assist: riding fast to a red and then stopping is a waste of energy and effort; better to cruise and meet the light when it turns green. Where to mount the battery? The two most common ways to mount a battery are on the downtube or on the rear rack. Many downtubes have braze-ons for a bottle holder, which can be used to mount a battery. 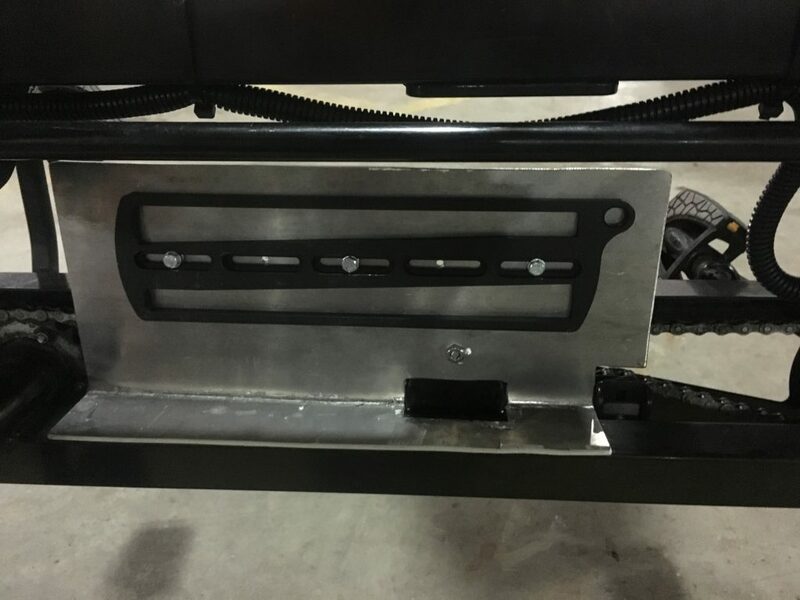 For rear racks, you can add a battery mounting plate to your existing rack, or get a new rear rack that is designed for a battery. Both of these solutions allow you to lock the battery to the frame, which is important in an urban environment, because the battery is the single most expensive component of your electrification kit. An alternative used by some recreational riders is to put the battery in a bag in the frame. If your family bike is used for transportation around town, and is left outside, then you either need to use a more secure battery mount or bring the battery inside with you at every stop. None of these conventional options really did what I wanted for our family tandem, so I designed a custom solution with Malcolm Munro from Biseagal. I didn’t want to put the battery on our rear rack because I wanted to keep our existing child seat, didn’t want to raise it higher, didn’t want any more weight on the rear of the bike, and wanted to keep our existing rear rack. The tandem gearing reduced the width available in the frame for a downtube battery, so we couldn’t go with that option either. In the end we used a low-profile rear rack battery mounted sideways. It fits in the frame perfectly, keeps the weight low and forward, and enables us to leave the rest of the bike unchanged. It has two components: the battery mounting bracket from Grin attached to a custom backing plate from Biseagal, which is itself secured to the bike. Grin’s bracket design cleverly has the battery twist on and off, rather than slide. Biseagal’s design of the custom backing plate is simple and elegant. All of the load bearing is in the materials: the fasteners do not bear the primary loads. The vertical load is taken by resting on the bottom tube, and the linear loads are taken by precise fit between the custom plate and existing braze-ons for the chainguard. Custom battery mount on family tandem. The aluminum backing plate is a custom design by Malcolm Munro at Biseagal in Toronto. The black mounting bracket is a product designed by Grin Technologies (ebikes.ca) in Vancouver. Adding electric assist to your family bike can increase your range, melt away hills, and help you navigate the city with greater agility. We can now run errands, such as bulk shopping, and visit friends that we could not get to by bike before. It’s an investment that pays for itself quickly, creates quality family time, and improves your health. See you in the bike lanes!